Contact Form for CALE Now! 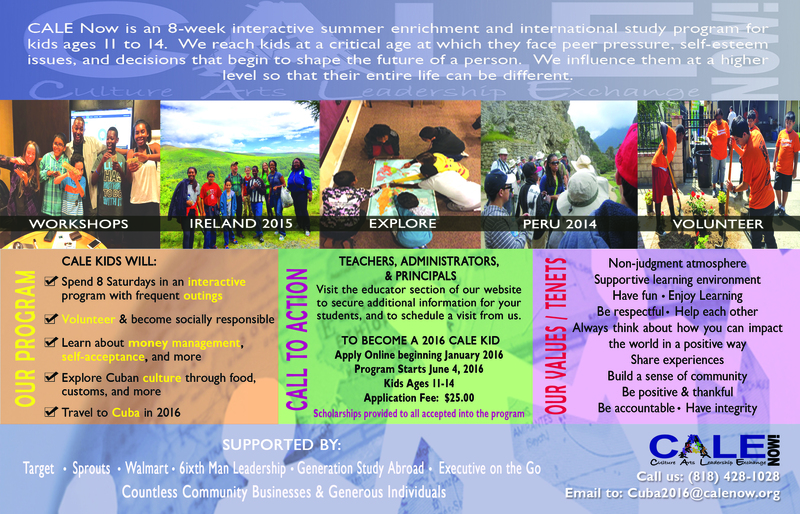 Applications will soon be available for our award-winning 8-week summer enrichment and international study program! Over the past 2 summers CALE Kids volunteered to feed veterans and plant gardens, they learned how to manage money and calculate exchange rates, they learned about self-acceptance and responsibility, and made commitments to positively change themselves, their families, their communities, and the world. They’ve journeyed to Peru to visit the Sacred Valley and Machu Picchu, and to Ireland to explore the ancient castles and give back by beautifying the wetlands. Next summer we head to Cuba. This marks our 3rd year promoting to area schools, and we thank you for giving us the platform to present an amazing opportunity to your students. We’ve already had several students from Magnolia Science Academy 1, where Principal Mustafa Sahin, who is also on our Advisory Board, leads. We’d love to add your school to the list. To that end, we have mailed to you a postcard with more information, and we encourage you to visit our website and social media pages to view the CALE Now experience. We’ve also included with this email an introductory letter that you can share with parents/caregivers. We are positive that you have deserving students at your school, and we look forward to meeting them and receiving their applications to become CALE Kids. Our program is valued at over $4,000 per student, however all of our students have attended at no cost. We encourage families with limited resources to apply, as all students accepted into the program will receive financial assistance. Parents simply pay the $25 application fee and secure the student’s passport. Please contact us to schedule a visit to your school to talk to your colleagues and/or students about how to join our program and the value of the experience. We are always interested in quality volunteers, donors and facilitators, so please contact us if you or anyone you know is interested in joining the CALE Now family. Thank you for your support! Follow us on Facebook, Twitter, LinkedIn, and Instagram!